The Cell Pack Solutions CPS1391 is a NiMH battery replacement for the Babyliss for Men Easy Cut Clipper (7435U) and also for the 7056BU, 7895U and 692BU models. Fast delivery, despite the flagged made-to-order delay. I used these as a replacement for an older Babyliss model 7052U. Quite easy to fit if you’re happy to dis/reassemble, can use a soldering iron and are able work with small parts. A full description of the process (with pics) is at https://justtechiestuff.blogspot.com/ Saved a bit of cash and reduced the waste plastic scourge! Originally these batteries were out of stock , but Cell Pack promised to let me know when they had them in stock again, this they did and I ordered the items. The batteries were delivered very promptly and were fitted to the trimmer. The unit now works perfectly. I can completely recommend this company and it’s products, great service ! I needed to replace the rechargeable batteries on my Remington beard trimmer, unfortunately I did not know the spec of the existing batteries. 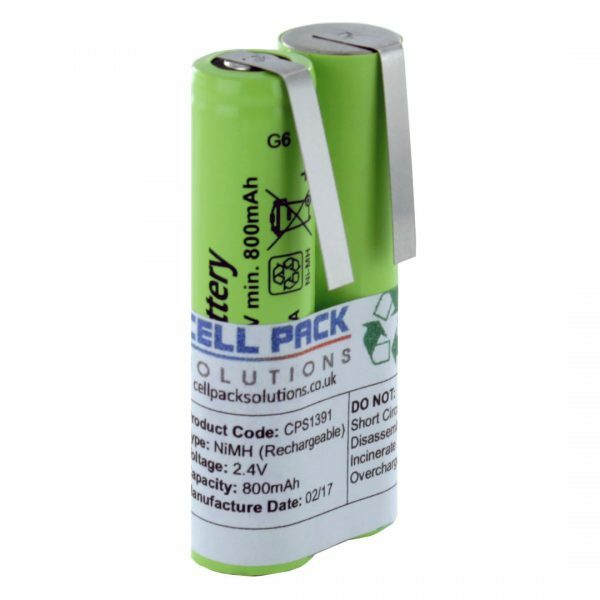 I contacted John at Cell pack solutions and sent a couple of photo’s and he identified the correct batteries by return. The battery pack had to be made up which took one day and a further two days for delivery, signed for Royal Mail. Good communication throughout order and delivery process. Fitted the new batteries and charged up and now trimmer is working fine. Great service. But after fitting to the trimmer it still did not work. I am not complaining about the batteries and have now replaced the Trimmer. Ok, so I ordered these batteries for my hair trimmer and it turns out that after opening up the trimmer to fit them they were not actually the same as the battery fitted to this model. Bit of a nuisance really but eventually I received a full refund including postage. Happy enough with that outcome, sorted to my satisfaction, mistakes happen.